We finally did it! My two cousins, Donnie and Bobby Smail, Bob (My step father.) and myself were together on a limited but fun hunt. Bobby and myself were acting the “dogs” this day since we have tagged out. Bob and Donnie would be watching with hopes of a deer coming close to their awaiting smokepoles. A surprise blanket of snow with winds greeted us early in the morning. I, personally, saw eleven deer in the three hours we hunted. I, also, saw three squirrels and a grouse. bobby saw deer and a coyote. the two watchers saw deer, but were not close enough for a shot. At one point I was closing the gap to the end of the push and I spotted two bedded deer. I was well within flintlock range. I attempted to get closer for a camera shot when the two jumped u. They were heading to where I thought Donnie would be. I turned to go upslope to turn them and walked into Donnie. If he would have walked about fifteen steps farther he would have been on top of the bedded deer. We surprised each other. Bob was cold, I had plumbing issues still and Bobby had to meet a client so the day ended early. Things were not going very well. I was sanding in the garage and upon stopping the sander I could hear something in the basement. I investigated to see water shooting up from the hot water tank. I immediately shut down the water and called for plumbing assistance. I could not obtain their services until December 26th. (Lucky for us we had water stored here for such emergencies and I “fetched” water from the creek for flushings!) 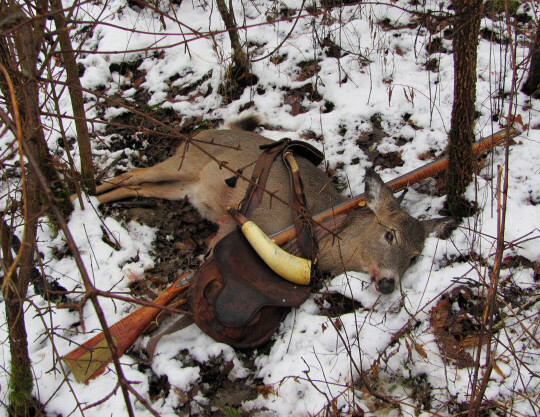 I would missing the opener of the flintlock season. We did, however, have some quality time with family on Christmas Day. Today, along the road in the area I hunt I could see a buck in the pre-dawn light. He would be crossing into the area I would be hunting in a short time. I mentally decided I would be hunting for buck only until 9:00 A.M. I had plans in the afternoon so my day afield would be short too. I passed up on two bedded deer and watched another walk below and bed down as I was sneaking along. The deer didn’t see me. I shot this deer with the camera. Suddenly, a deer bolted and stopped into the field. 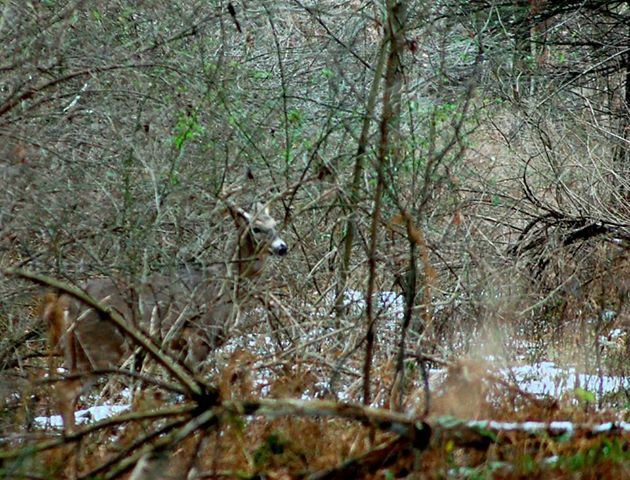 A buck appeared out of my range and with that classic head down proved his intentions. He was chasing the doe. They crossed over the road again. 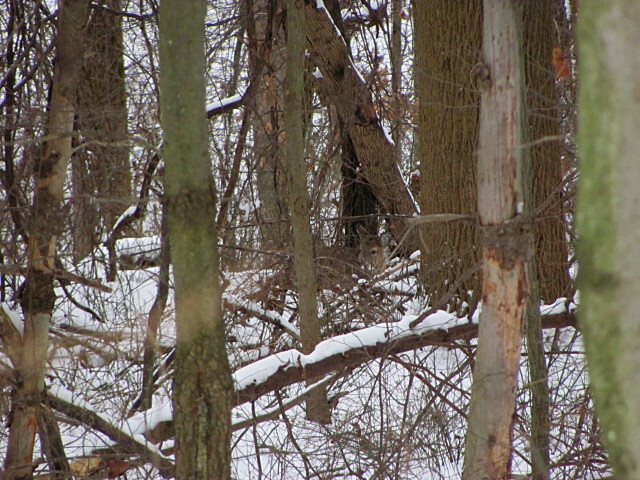 I circled around and spotted four more deer bedded in a deep ravine. I was about forty yards from them. They were all doe and they remained until the one noticed the camera being pointed at them. I worked along a hillside and had a few more deer sightings. I spotted an owl flying through some pines. Two deer walked out of some tree tops and passed me. I failed to shoot. The time was 8:45 A.M. I began to walk up a slope and I saw these two deer again. There was a lot of feeding activity so I knew more deer needed to be close. I saw a place where a buck had pawed his scrape out again from snow. I approached a small round top area and saw two deer jump up at point blank range. The one went to my left and the other bolted to my right. The one on my right stopped and was wondering why it had bolted. The deer didn’t see me. It had reacted to the deer that had seen me. Old Jacob and the doe. The 58 yard shot was true and I found the deer 70 yards farther along. The time of the shot was 9:05 A.M. The mile long walk would be reality now. The snow cover made the drag easy. I saw five more deer as I closed in towards my vehicle. In total I had about 26 deer sightings with some being the same deer I am sure. 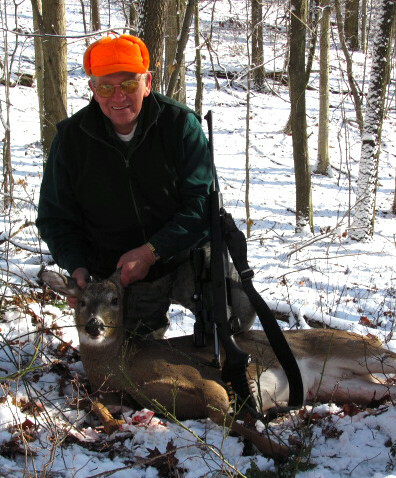 I am now out of tags and will be “dogging” for my step father, Bob and my cousins. Tomorrow will begin in a somber tone. We will be attending a friend’s memorial service. Randy Tost had passed away earlier this month. Laurie and I will be spending time with her family later on. Many years ago, in the land of Israel, a baby was born in a lowly sort of stable. He was placed in a hay-filled manger. This baby, destined to be the King of the Jews and, later, the Savior of mankind, would sleep next to farmland animals. The odor of stable smells permeated the air. Dirty conditions would be surrounding this little bundle of happiness. The place was a humble site, not in any way, resembling the luxury found for the birth of any worldly king. 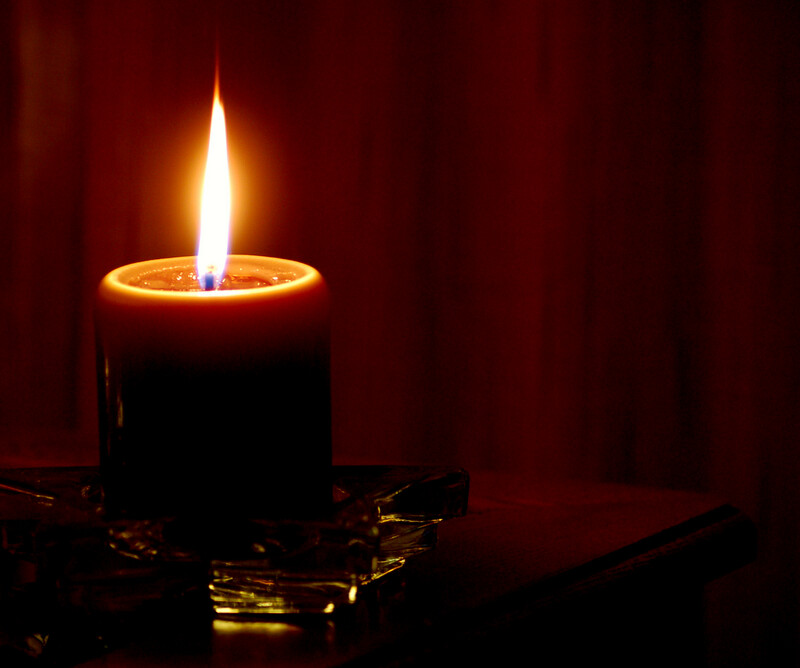 This first advent would be the result of many years of prophecies. However, few would believe and accept the things to come. The babe, born in the City of David, known as Bethlehem, was nothing out of ordinary. He looked just as any other Jewish baby would have looked like at the time. Nearby in fields, via angels the shepherds witnessed the singing and explanation of a savior being born. They went to Bethlehem in search of this savior. They couldn’t remain silent of what they had seen and spread the joyous news! Wise men from the east (Probably the present-day area of Iran or Iraq.) were well-taught in the field of the stars. These men witnessed a sign of a new light in the eastern night sky. They researched and headed west to seek out this prophesied birth. In time they discovered the baby, now in a house, and worshipped him. They gave him gifts for his life’s journeys. This event has been talked about, preached about and sang about for many years. The baby would grow and at thirty years of age, in compliance with Jewish law concerning the priesthood, would begin his ministry preaching of the KINGDOM OF HEAVEN. Only if Israel would have accepted his message. He would be rejected by his own people of Israel and die on the cruel Roman cross. (Gentiles) He would rise again after three days and three nights and ascend to glory forty days later with the promise to return. When this current era of the Gentiles reaches the fullness of time the baby’s second advent will be reality. However, this time he will come as the most powerful King. His rule will bring an end to the evil and chaos of the world. The kingdom will be present! Thy kingdom come on earth as it is in heaven! For those who truly believe this fact of resurrection with complete faith will receive the Holy Spirit baptism and merciful grace. They who believe will, also, see eternal glory. This is the BEST CHRISTMAS PRESENT ANYONE COULD RECEIVE! I was a little late entering the woods this morning. We had a fresh coating of snow, but not very much. On top of the snow some light freezing rain had fallen over the nighttime hours. 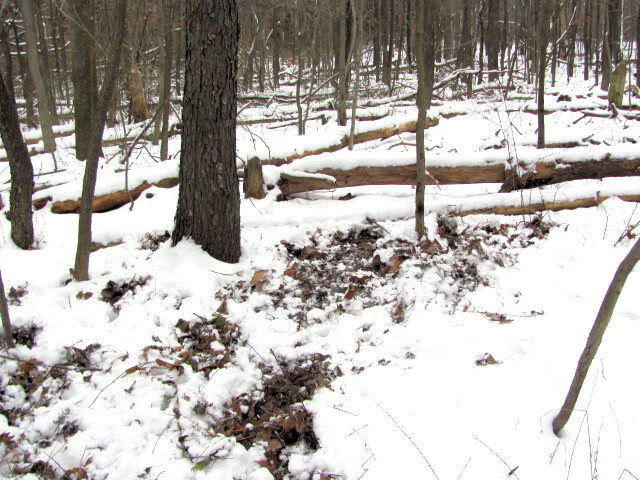 I cleaned off the drive and decided to head off to the woods to hunt for an antlerless deer. Our venison supply was extremely low. 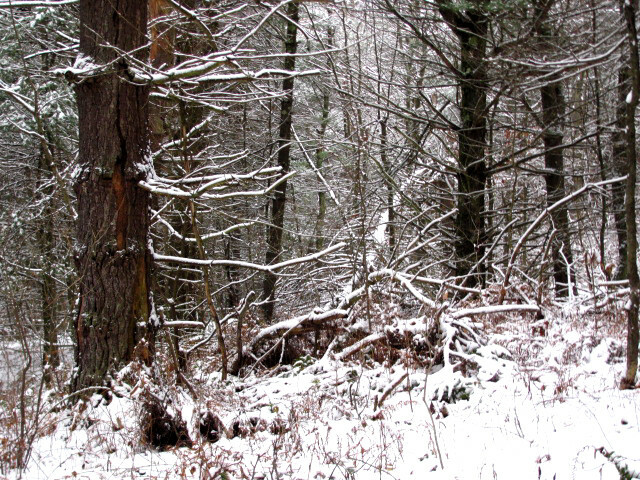 I entered the woods after 8:00 A.M. and immediately saw fresh deer and turkey tracks. I later saw 10 turkeys at two different times over the next hour or so. I saw two deer before I was 50 yards from the road. My still hunting approach allowed more sightings. Thoughts of my friend’s passing surfaced from time to time. He would have loved this story! I trailed the deer for about another hour seeing it once. I encircled a very brushy area and spotted a deer laying. When I felt confident it was the same deer I cocked the flintlock and the deer jumped up and took off. Obviously, this deer was in good shape! 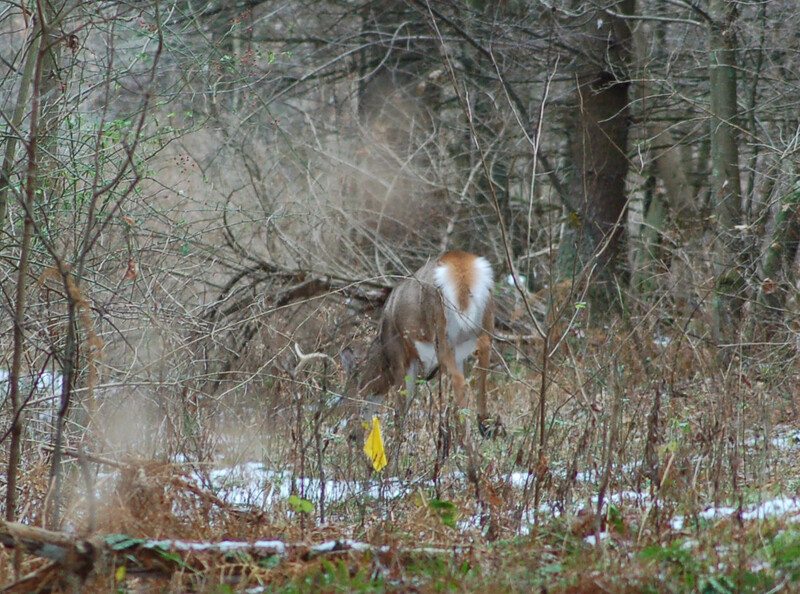 Later, I circled around in the direction to where I had watched the deer go. I walked an old gas well road to try to catch a view of the deer. I looked to my left and saw a bedded deer about 15 yards from the road’s edge. The site was very thick with tree tops and briars. I couldn’t shoot because I wasn’t sure if this was the same deer. I continued moving quietly along until I spotted the deer’s tracks crossing the road. I knew this was the same deer now. I eased back and once I had spotted the deer again I picked an opening and shot. The time was 10:15. What a chore removing the deer onto the road where dragging would be easy. I had about 12 deer sightings and saw several squirrels in the short time of my hunt. A great morning indeed. Tomorrow I will be butchering. Randy this one is for you! Really good friends are a blessing. I received a phone call this morning relaying words I knew would be coming. The words of the passing of one of those dear friends. Randy Tost and I became acquainted through his interest with my wildlife art. We quickly became friends and a rare bond developed. We visited each other from time to time to talk over our many similar interests. We would often talk hunting. He enjoyed my adventures through this site and I enjoyed reading his journal notes. We, both, loved the natural world. We were brothers in Christ too. The two of us were in total agreement over the current political state of America and concerns of the future of this country. Randy was seeing a potential issue over diabetes and began walking to decrease his weight and, hopefully, correct this prior to needing insulin. However, the walking and weight loss wasn’t helping with the diabetes. The disease was progressing. Eventually, it was discovered he had pancreatic cancer. This explained the increase of the disease. We continued visiting each other until very recently when medication and health would just “play him out”. I wondered over his decision to not obtain any treatment, but I respected and admired his courage. Randy had lost his wife sometime ago to the terrible disease of cancer. He knew the issues and prolonging that often accompanies the treatment. 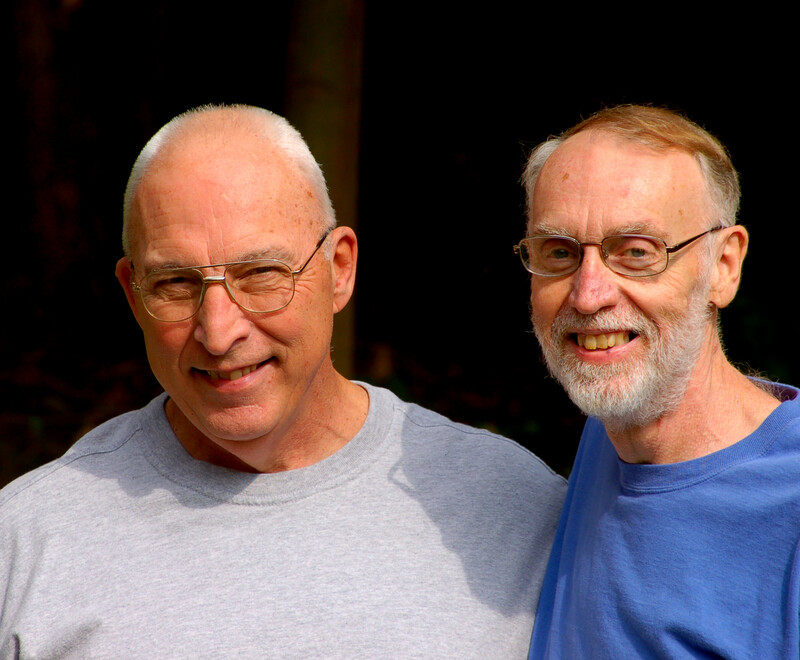 As the leaves were turning red and yellow, Randy invited me to visit him and his best friend John Helinski. John lives in Alabama currently, but they had been friends for many, many years. Big John, as he is commonly known, and I immediately bonded and our talks were as if we had known each other for years. He is a good man! I have met some of the offspring of Randy and Susie Tost and I found them all to be exceptional young men and women. Randy was very proud of his children. Randy, my friend, rest in peace and I’ll see ya along the trail!!! What a great day to be in the woods. Friday evening produced approximately one and a half inches of fresh snow. 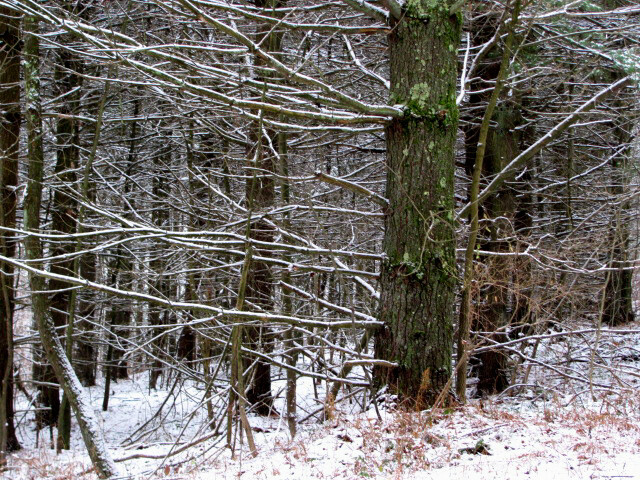 The trees had the snow on their branches and the results were something to behold! This was my second day to hunt bucks. 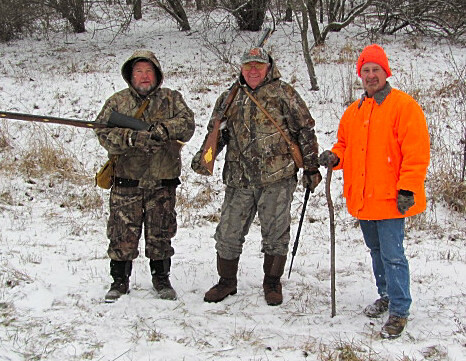 The weather was perfect to hunt the white-tail. I had viewed 32 deer by noon including one small buck. Most were antlerless and some could not be identified due to brush, etc. The antlerless deer season began this morning as well. 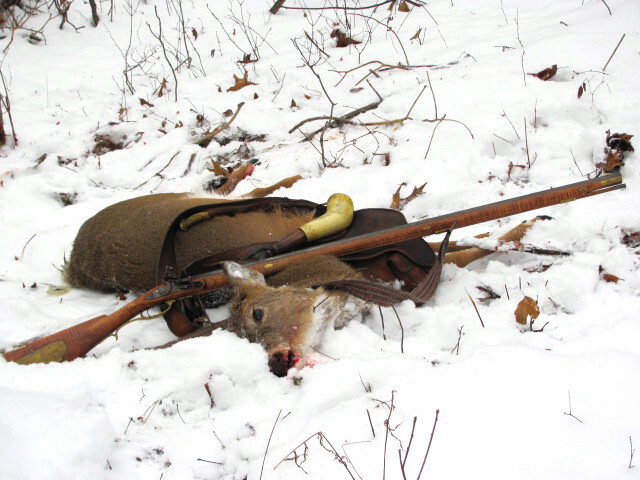 I elected to hunt only buck and wait until next week to pursue my passion of hunting deer with the flintlock rifle. I imagine few hunters will be out allowing me to sneak around. I will take a doe next week if the opportunity arises. I could have taken 9 doe easily this day. Instead I counted “coup”. The western Indians would try to touch an enemy rather than kill an enemy to receive “big medicine.” They believed it took more bravery to touch an enemy over killing. In my weird way, I count the positive deer kills as coup although I never fire a shot. The deer appreciate it! In all probability I only stayed within a couple of hundred yards all day. 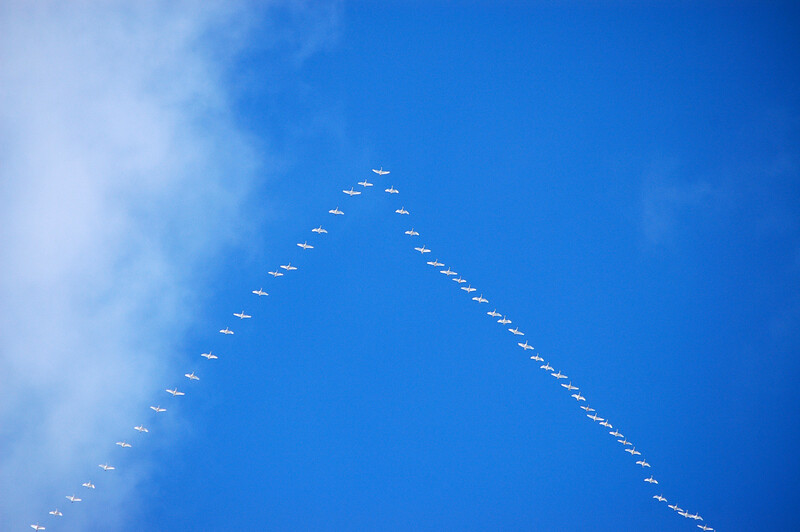 I walked only a little at times, but would return to the same area to watch. My step-father, Bob was above me on the top of the hill. The noon hour passed me when I could hear the distinct sound of deer walking behind me. I managed to turn and see five deer. They came to about 18 yards. They were all bald having no head ornaments. One saw me move to grab my camera. I failed to get any shots. In fact the only photos of deer I managed to take were blurry. I might need new glasses. Prior to one, I heard Bob shoot. I communicated and found he had, indeed, shot a deer, but couldn’t find it yet. (Lots of green briars here.) I arrived a few minutes later to see him standing over the deer. The drag was a long one, but the snow allowed for ease in dragging. All told, I had 39 deer sightings; one squirrel and a flock of swans. It was a great day!